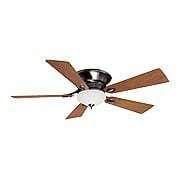 Flush mount ceiling fans are ideal for rooms with standard 8' ceilings. Perfect for living rooms, bedrooms, kitchens and family rooms. Available in a wide range of attractive styles. All required hardware is included for easy installation. Featuring both subtle and bold lighting with a nod to classical and art deco, the Delano II is a stylish addition to your home. Less than 11"in height, it's flush mount is ideal for rooms with standard 8' ceilings, including the living room, bedroom, kitchen and family room. 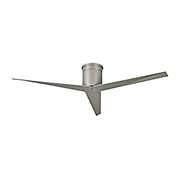 It is finished in polished nickel and features a white frosted glass shade and five silvery blades. The full function wall control offers 3 speeds in forward and reverse, as well as a full range light dimmer. The Durant ceiling fan brings a sophisticated look at an excellent value. Reversible veneer blades let you change the look of your room with a lighter or darker finish, and cased white-glass fitters add the finishing touch. 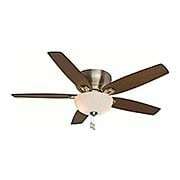 Ideal for medium-size rooms, its powerful, smooth running motor runs blissfully quiet. 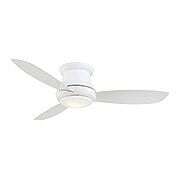 Featuring a simple, clean design, this durable fan is at home anywhere, and promises years of maintenance-free operation. Comes complete with pull chain for quick and easy on/off and speed adjustments. Can be used with or without light kit. 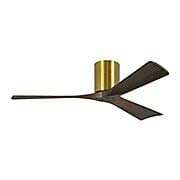 Whether indoors or out, the Verse ceiling fan brings sleek, modern style to your home. Thanks to an ETL damp rating, it's a fitting centerpiece for interior rooms, or covered porches, patios, and sunrooms. The three-position mounting system adapts to your needs by accommodating standard, flush, or angled mounting, and the powerful motor runs blissfully quiet. Comes complete with universal handheld remote, integrated LED light, and cased-glass shade. Should you wish to operate without the light, simply replace the opal glass shade with the included cap. 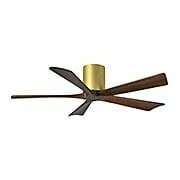 The Corazon Ceiling Fan enhances any setting, from a traditional dining room to formal living room. 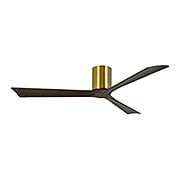 Adorned with decorative foliage, the housing and shade are complemented by its aged-bronze finish. Reversible blades let you change the look. Choose from walnut or aged bronze finishes. Comes complete with on/off pull chain. Featuring both subtle and bold lighting with a nod to classical and art deco, the Delano II is a stylish addition to your home. Less than 11"in height, it's flush mount is ideal for rooms with standard 8' ceilings, including the living room, bedroom, kitchen and family room. 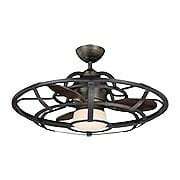 It is finished in dark restoration bronze and features a rustic scavo glass shade and five dark walnut blades. The full function wall control offers 3 speeds in forward and reverse, as well as a full range light dimmer. 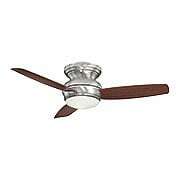 The Durant ceiling fan brings a sophisticated look at an excellent value. 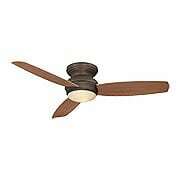 Ideal for larger rooms, it features snow-white wood blades and a powerful motor that runs blissfully quiet. Comes complete with pull chain for quick and easy on/off and speed adjustments. 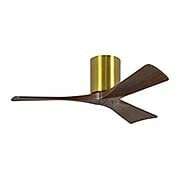 With five neatly joined, walnut-stained wood blades complemented by a smooth cylindrical housing, the Irene 52" Flush-Mount Ceiling Fan is a striking addition to any modern home. 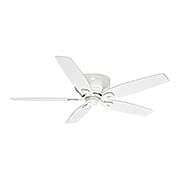 Featuring cast aluminum and stamped steel construction with reversible DC motor, this streamlined design is energy-efficient, durable, and ultra quiet. 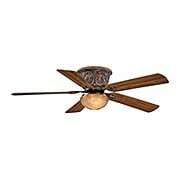 Compatible with flat or vaulted ceilings, it comes complete with a 6-speed hand-held and wall-mount remote control. 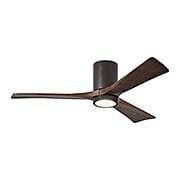 Whether indoors or out, the Verse ceiling fan brings sleek, modern style to your home. Thanks to an ETL damp rating, it's a fitting centerpiece for interior rooms, or covered porches, patios, and sunrooms. The three-position mounting system adapts to your needs by accommodating standard, flush, or angled mounting, and its powerful motor runs blissfully quiet. Comes complete with universal handheld remote, integrated LED light, and cased-glass shade. Should you wish to operate without the light, simply replace the opal glass shade with the included cap. 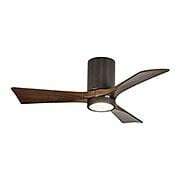 With three neatly joined, walnut-stained wood blades complemented by a smooth cylindrical housing, the Irene 42" Flush-Mount Ceiling Fan is a striking addition to any modern home. 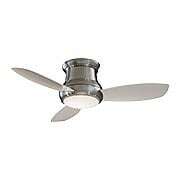 Featuring cast aluminum and stamped steel construction with a reversible DC motor, this streamlined design is energy-efficient, durable, and ultra quiet. 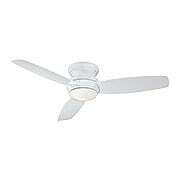 Compatible with flat or vaulted ceilings, it comes complete with a 6-speed hand-held and wall-mount remote control. 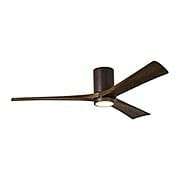 With three neatly joined, walnut-stained wood blades complemented by a smooth cylindrical housing, the Irene 52" Flush-Mount Ceiling Fan is a striking addition to any modern home. Featuring cast aluminum and stamped steel construction with a reversible DC motor, this streamlined design is energy-efficient, durable, and ultra quiet. 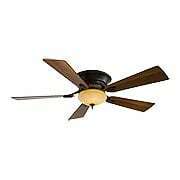 Compatible with flat or vaulted ceilings, it comes complete with a 6-speed hand-held and wall-mount remote control. With three neatly joined, walnut-stained wood blades complemented by a smooth cylindrical housing, the Irene 60" Flush-Mount Ceiling Fan is a striking addition to any modern home. Featuring cast aluminum and stamped steel construction with a reversible DC motor, this streamlined design is energy-efficient, durable, and ultra quiet. 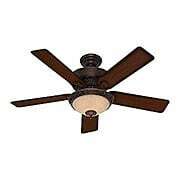 Compatible with flat or vaulted ceilings, it comes complete with a 6-speed hand-held and wall-mount remote control. Featuring both subtle and bold lighting with a nod to classical and art deco, the Delano II is a stylish addition to your home. Less than 11"in height, it's flush mount is ideal for rooms with standard 8' ceilings, including the living room, bedroom, kitchen and family room. It is finished in pewter and features an etched marble glass shade and five gleaming walnut blades. The full function wall control offers 3 speeds in forward and reverse, as well as a full range light dimmer. 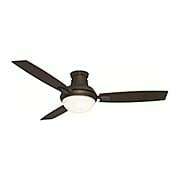 The Durant ceiling fan brings a sophisticated look at an excellent value. Reversible veneer blades let you change the look of your room with a lighter or darker finish, and cased white-glass bowl shade adds the finishing touch. 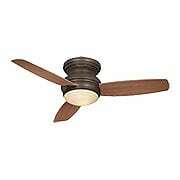 Ideal for larger rooms, its powerful motor runs blissfully quiet. 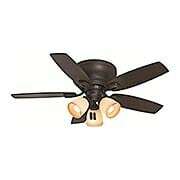 Featuring a simple, clean design, this durable fan promises years of maintenance-free operation. Comes complete with pull chain for quick and easy on/off and speed adjustments. Can be used with or without light kit. With three neatly joined, walnut-stained wood blades complemented by a smooth cylindrical housing, the Irene 42" Flush-Mount Ceiling Fan with Light Kit is a striking addition to any modern home. Featuring cast aluminum and stamped steel construction with a reversible DC motor, this streamlined design is energy-efficient, durable, and ultra quiet. 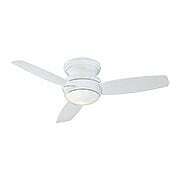 Compatible with flat or vaulted ceilings, it comes complete with a 6-speed hand-held and wall-mount remote control. With three neatly joined, walnut-stained wood blades complemented by a smooth cylindrical housing, the Irene 52" Flush-Mount Ceiling Fan with Light Kit is a striking addition to any modern home. Featuring cast aluminum and stamped steel construction with a reversible DC motor, this streamlined design is energy-efficient, durable, and ultra quiet. Compatible with flat or vaulted ceilings, it comes complete with a 6-speed hand-held and wall-mount remote control. With three neatly joined, walnut-stained wood blades complemented by a smooth cylindrical housing, the Irene 60" Flush-Mount Ceiling Fan with Light Kit is a striking addition to any modern home. 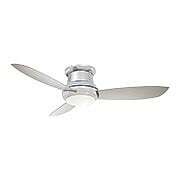 Featuring cast aluminum and stamped steel construction with a reversible DC motor, this streamlined design is energy-efficient, durable, and ultra quiet. 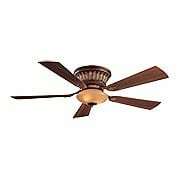 Compatible with flat or vaulted ceilings, it comes complete with a 6-speed hand-held and wall-mount remote control.